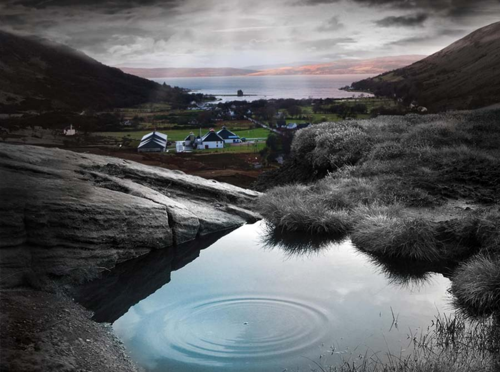 The Isle of Arran, sometimes referred to as “Scotland in miniature,” was once home to more than 50 whisky distilleries. But that was the 19th century and times changed; distilleries disappeared. When The Arran Distillery opened in 1995, it bookended a gap of 160 years in which whisky production was stalled on the island. How the locals survived nearly two centuries without the water of life flowing in their backyard we’ll never know. But I’m sure that there was much fanfare when the first casks of Arran single malt were cracked open in 1998. The island was back in business. Fast forward two decades, and it has become undoubtedly clear that Arran is here to stay. Their latest worldwide release, Arran 18, is the distillery’s first official 18-year whisky, and is a testament to just how good this young whisky company has already become. For me, this milestone also solidified something I was already starting to believe: that Arran is one of the most exciting distilleries in Scotland today. You might think that with the early success that Arran has had, other distilleries may have followed suit on the island. But Arran is still the only distillery on the Isle of Arran. Their approach is very much quality over quantity, and as one of the few remaining independent distilleries in Scotland, this is a promise they can actually live up to. As further testament to the quality of their operation, Arran was named “Scottish Distiller of the Year” by Whisky Magazine in 2007 (not even ten years into their journey). 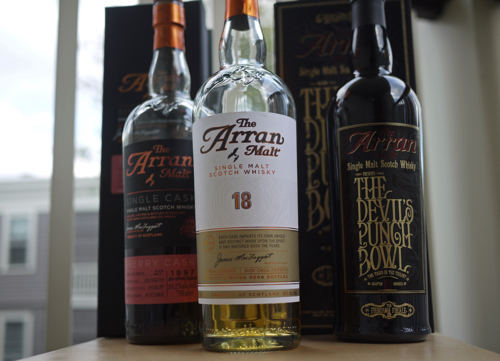 I’ve picked up a number of Arran’s releases over the past few years, including the milestone Arran 18. Here is a look at some of my favorites, as well as a glimpse into what you should be looking out for from this young distillery in the near future. 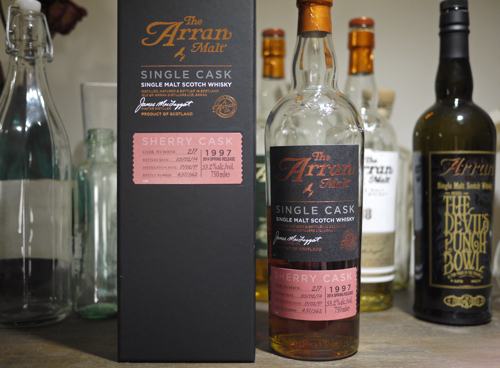 The Arran Cask Finish series was first introduced in 2010 with the release of the Amarone cask-finished whisky. The Port and Sauternes editions followed shortly thereafter. Each of the bottlings see about 10 years in barrel, including about 12-15 months of finishing time in their respective casks. The Sauternes edition is bottled at 50% and retails for about $60. When I first opened this bottle the Sauternes was borderline overpowering, but after giving it some air and time it opened up really nicely. As to be expected, there’s a lot of candied orange and sweet wine notes from the Sauternes on the nose. But behind that is a vivid perfume of melon, nuttiness and even a little banana. The whisky has a rich sweetness to it on the palate, that’s well balanced by spice and toasted oak. There’s also fruit, honey, some oceanic salinity, vanilla and evidence of the Sauternes casks from front to back. The whisky finishes with a big spice punch that lingers. Arran has released quite a few limited single cask and small batch releases in their short history (many of which never make it to the US, unfortunately). I picked up this Sherry Cask 1997 2014 Spring Release earlier this year for a blind whisky tasting event. It easily took the group’s favorite of the evening, and I have enjoyed it more and more ever since. This release is just shy of 17 years, and was aged in first-fill Sherry casks. It’s 53.2% and there were 562 bottles produced. On the nose there’s an immediate presence of strong Sherry notes, followed by dried fruits, toffee and hazelnuts. The whisky is smooth and astonishingly drinkable for a 53% spirit, and with a little water the body turns almost silky. 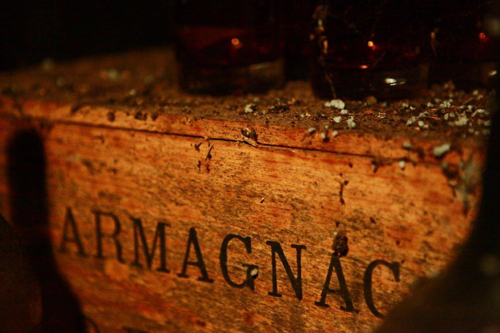 It’s decadently rich, smokey (not in a peaty sense), peppery, and touched by a sweet fruitiness. 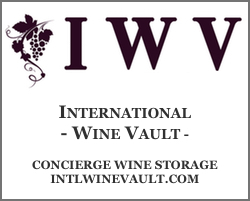 The finish is dry and spicy, with a mild tannic quality. 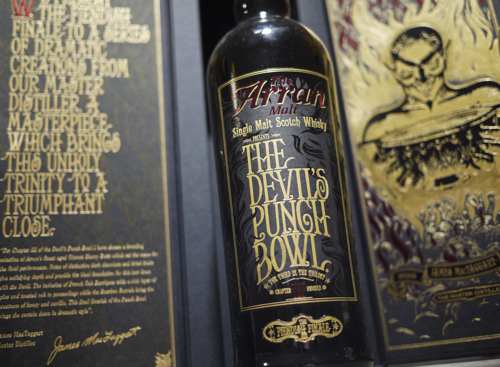 The Devil’s Punchbowl was a limited edition three-part series first released in 2012. Each whisky represents a blend of casks selected by Arran Distillery Manager James MacTaggart. The final release, The Fiendish Finale, was unveiled last year and includes whiskies from eight Sherry butts, eight French oak barriques and five Bourbon barrels. I didn’t get a chance to try the first two Devil’s Punchbowl releases so I can’t give you the head-to-head, but I can tell you that this whisky is the most raw, manly whisky of the bunch. There’s some of that staple Arran fruitiness on the nose–mild peach and citrus. But that sweetness is balanced by a raw power that comes swinging in like the Devil himself. The palate is super dry, chewy and smokey (again, not a peat smoke), with glimmers of sweetness from the Sherry casks. 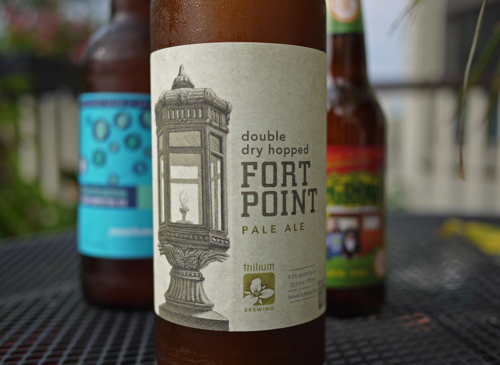 There’s caramel and dessert-notes as well, but bitter and brine reels it in. Arran started celebrating the countdown to their first official 18-year whisky with the release of the limited edition Arran 16 in 2013. That was followed up by the Arran 17 in 2014 and, finally, the 18-year in 2015. 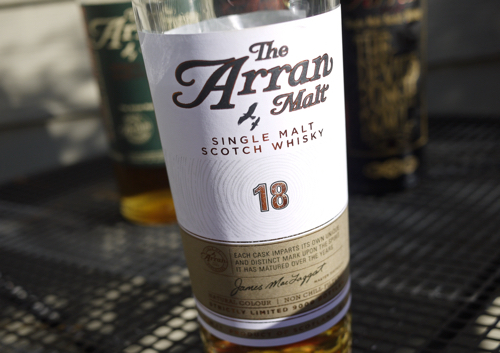 Only 9,000 bottles of the Arran 18 were released worldwide, and they hit the US market this past summer. The whisky was bottled at 46% and retails for about $110. Unlike the Sherry Cask 1997, the 18-year was matured in ex-Sherry casks, so it’s a lighter whisky and not as steeped in Sherry notes. The nose is super fruity, with rich honey tones, some Sherried nuttiness and chocolate. 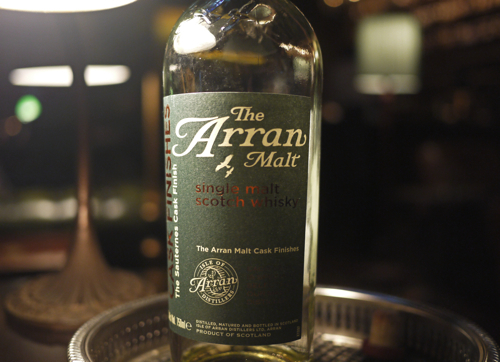 The palate is one of the most balanced of any of the Arran whiskies I’ve had to date. It’s buttery smooth, with berries, baking spices and orange, vanilla extract, some dessert-like notes, charred oak and a dry, spice-driven finish that lasts forever. There is definitely a Sherry presence to the whisky but it’s well integrated and not over the top. One can only expect that the next major milestone for The Arran Distillery will be the release of their first official 21-year. But, in the meantime, expect to see more limited edition releases trickling into the US. The distillery just recently announced a new whisky called The Bothy Quarter Cask, which went on sale on their web store a couple weeks ago and should be hitting US shelves in the next few months. The Bothy is a cask strength release, matured in first-fill ex-Bourbon barrels, and finished in smaller American oak quarter casks for a minimum of 18 months. Also look out for Smugglers’ Series Vol. 1 ‘The Illicit Still,’ which was released on the company’s web store in September and should be hitting US shelves around the same time as The Bothy (so I hear). This is a peated whisky, bottled at cask strength, and is part of another three-part series. This distillery seems to really enjoy these trilogy’s. Those are the two next in line, but check out Arran’s White Stag newsletter to keep up on all of the new releases that are sure to be announced in the coming year. 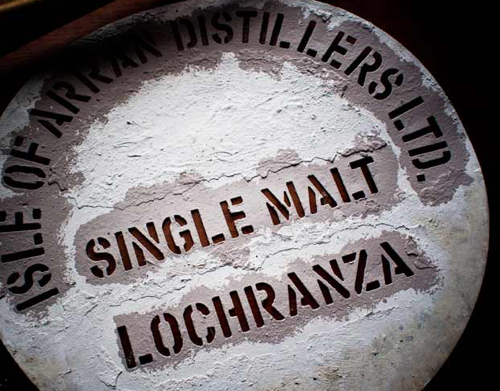 What Arran whiskies have you enjoyed most? 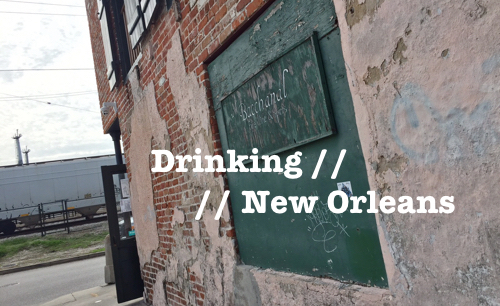 Previous ArticleWeekly DrinkDown: New Drink Books, Cool Homebrew Tech & The Substance!